An excellent serving utensil for salad bars, the Winco PUT-9K Polycarbonate Utility Tong, Black 9" is a sanitary and hygienic choice for your foodservice operation. Choose from an assortment of different colored tongs so you can assign different tongs to different food groups in order to prevent cross-contamination. 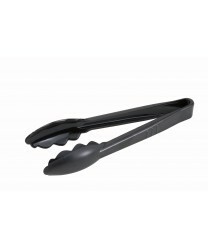 In addition, these plastic tongs are durable, dishwasher safe and feature a scalloped edge design which makes transferring food from the buffet table to your plate a simple task. Great for use on fruit platters, salad bowls and on the buffet line, these polycarbonate tongs will have many functions in your commercial kitchen.